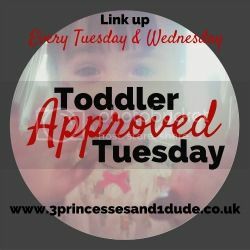 Welcome to another Toddle Approved Tuesday! Come and link up beloweach Tuesday from 6am until 11:55pm on Wednesday and I’ll pick two favourites to showcase next week. Don’t have a blog? Then show us what you’ve been up to on Facebook, Instagram and Twitter using the #ToddlerApprovedTuesday. We’ve had a lot of fun this week making our our video for Kids Make and Bake Club and Georgia loved getting to star in her own YouTube video – check out our Rainbow Pasta Necklaces. My lovely co-host Becky over on 3 Princesses and 1 Dude! has been busy making these easy but beautiful Butterfly Wall Hangings. My two favourites from last week are these amazing looking Mini Smores No-Bake Bites from Lynzy & Co. and this delicious looking Mixed Vegetable and Herb Pie from Handy Herbs.